Take in the views from a terrace and a garden and make use of amenities such as complimentary wireless Internet access. Additional amenities at this Art Deco hostel include concierge services, a television in a common area, and a picnic area. Getting to nearby attractions is a breeze with the area shuttle (surcharge). With a stay at Adrenalina Hotel - Adults Only in Sao Paulo (Zona Leste), you'll be within a 5-minute drive of Corinthians Arena. This hotel is 4.4 mi (7.1 km) from Aricanduva Shopping Center and 7.7 mi (12.4 km) from Metro Boulevard Tatuape Shopping Center. 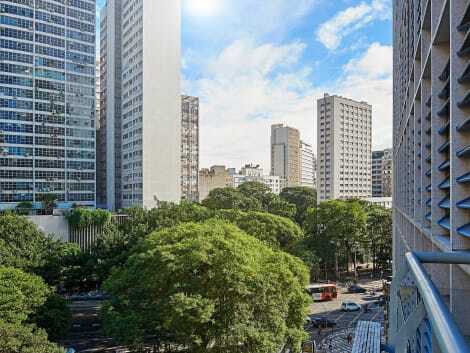 Located in São Paulo city centre, the Reinales Plaza offers accommodation 500 meters from Republica metro station. The hotel features free Wi-Fi in public areas and a 24-hour reception. The air-conditioned rooms of the hotel, set in a modernist-style building, have private bathrooms a TV and a minibar. Guests can benefit from some allergy-free rooms, also available. An array of inner-city cafes, shops and bistros surround the property providing a variety of eating opportunities. The Reinales Plaza Hotel gives easy access to the city’s renowned landmarks, such as the Museu Paulista do Ipiranga and the gothic Metropolitan Sé Cathedral. Paulista Avenue Financial Centre is a couple of metro stops away. Just 600 metres from República Subway Station, Hotel Internacional is located in downtown São Paulo. It offers air-conditioned rooms with free Wi-Fi. Parking is available at a site nearby. The practical rooms are simply furnished and supply a private bathroom. Their amenities include a TV and telephone. Buffet breakfast is available daily, with fresh fruits and cake. For lunch and dinner, visitors have several options in the surrounding area. The popular commercial street 25 de Março is 800 metres from Hotel Internacional São Paulo. Congonhas Airport is located 10 km away. With a stay at Flat Econômico in Sao Paulo, you'll be near the airport, within a 15-minute drive of Shopping Eldorado and Butantan Institute. 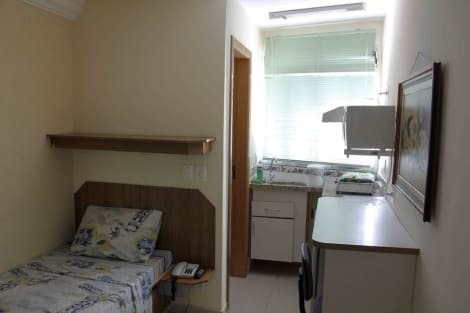 This aparthotel is 4.4 mi (7.1 km) from Paulista Avenue and 6.1 mi (9.8 km) from Ibirapuera Park. Enjoy a satisfying meal at Restaurante 14 IBIS serving guests of ibis Styles Sao Paulo Anhembi. Quench your thirst with your favorite drink at the bar/lounge. Buffet breakfasts are served on weekdays from 6:30 AM to 10:00 AM and on weekends from 6:30 AM to 11:00 AM for a fee. Located in Sao Paulo, Hostel Alice is within a 10-minute drive of Batman Alley and Paulista Avenue. This hostel is 1.9 mi (3.1 km) from Allianz Park and 2.5 mi (4.1 km) from Football Museum. It is difficult to comprehend the sheer scale of this mega city, which is one of the most populous on the planet and is dominated by hundreds of towering skyscrapers. Home to approximately 12 million residents, Sao Paulo features an eclectic blend of Neogothic and contemporary landmarks, and was one of the cities chosen to host the FIFA World Cup in 2014. Although Sao Paulo's size and characteristically urban aesthetics may seem daunting at first, the city boasts an endless number of world-class attractions and an exceptionally diverse restaurant scene. Founded in 1947, the Sao Paulo Museum of Art is one of the leading art venues of Latin America and showcases thousands of artefacts related to Brazilian, Asian and African art. The museum welcomes hundreds of thousands of visitors annually, and is housed in an enormous contemporary landmark designed by the esteemed Italian-Brazilian modernist architect Lino Bo Bardi. This historic avenue, which was designed in the late-19th century, is the location of the aforementioned art venue and is surrounded by many of Sao Paulo's most iconic skyscrapers. The avenue holds the world's largest gay pride festival, and contains many prestigious mansions and distinctive Neoclassical landmarks. Opened in 2006, the Museum of the Portuguese Language, as the name would aptly imply, examines the evolution of the Portuguese language over time, and is visited by well over half a million visitors each year. It also explores the history of the Portuguese-speaking population, with interactive exhibits and videos that tell the story of the language. Inaugurated in 1954, Ibirapuera Park is Sao Paulo's most beloved open space, and a fantastic oasis from the hustle and bustle of the city. Wander around the beautiful Japanese Pavilion, visit the Biennial Pavilion, and see some of the city's other popular attractions such as the Afro-Brazil Museum, the Museum of Modern Art and the Museum of Contemporary Art. For truly luxurious venues and world-class hospitality, Sao Paulo hotels are without equal. Book a stay at the Hotel Fasano Sao Paulo, the Emiliano Hotel, or George V Casa Branca. If you're after stylish, value-for-money Sao Paulo hotels, you could try the Quality Hotel Jardins, the Hotel Novotel Sao Paulo Jaragua Convention, the Mercure Sau Paulo Jardins Hotel, or Melia Paulista. It is impossible to list all of Sao Paulo's renowned restaurants in this article, but if you're after some delicious Italian dishes, you might want to consider dining at the Villa Roma Pizzaria, the Braz Pizzaria, and the Due Cuochi Cucina, or head to Era Uma Vez Um Chalezinho for more mouthwatering European-inspired food. For some excellent Brazilian cuisine, choose the Figueira Rubaiyat restaurant, enjoy some divine sushi at Temakeria Paulista, or head to Mocoto or Varanda Grill for other tasty Brazilian dishes.